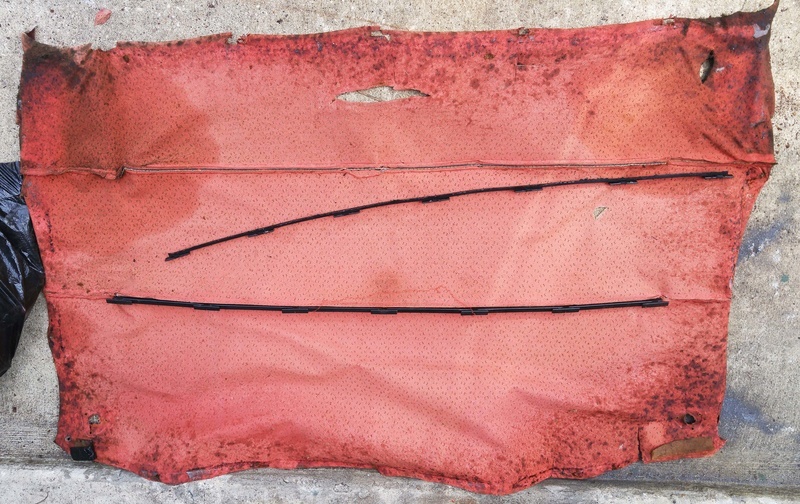 Re: 1973 chevelle headliner bows. I'm emailing back and forth with Acme headliners and upholstery. Their headliners come with all the bows attached. All ready to install. And rockauto.com has the best price at $79 plus shipping for a headliner for our cars. ugghh my luck lol, See mine was 98% gone when I got the car, so I ordered this just yesterday and the ad says have to re use stock bows and clips. My 73 headliner bows are plastic with T shaped hangers on top. Each bow is stitched to the headliner. thats the way mine is too, maybe im confusing bows with rods ? I need the rods correct. There are no rods in our headliners. Just 5 plastic bows with a T shape on top that hang on the ceiling. ok,well if im reading it correct it should come with those already sewn on the back.thanks for the help, mods I guess you can lock this one lol. My factory one was the same, plastic band with T's. 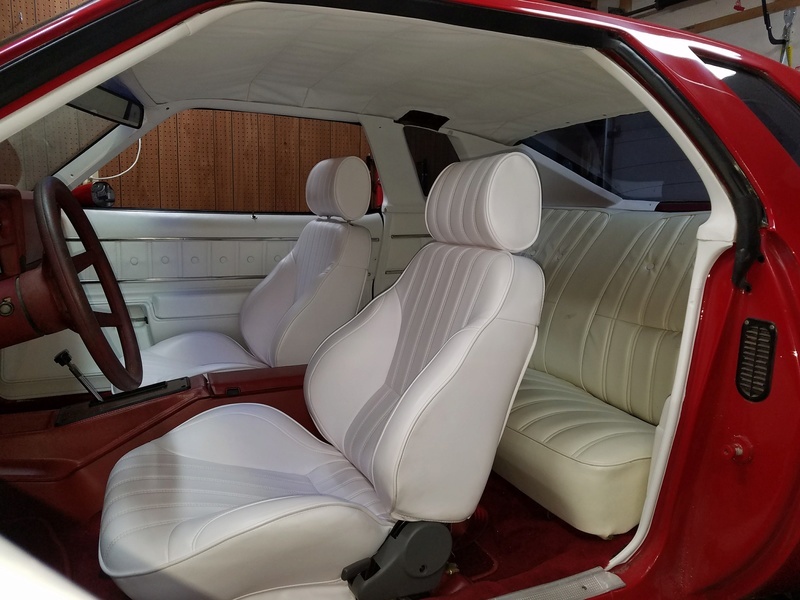 I bought the white one from Rockauto and dyed it the same white as the rest of the interior. I had to shorten the rods it came with so it would fit. 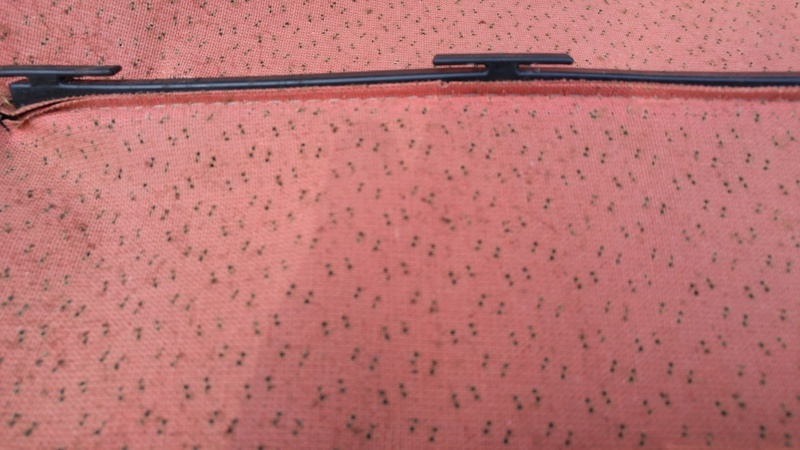 The plastic T's that came with the headliner were not sewn into it but fit over the rods and material. I didn't think it was a hard process, it just took some time to get it right. I have some wrinkles in mine but since its not a show car, it doesn't bother me. I installed a headliner on my 76 SS El Camino a few years back. I purchased it from OPGI and it had the bows and plastic clips that mimic the plastic bows with the "T" heads on them. All the sellers on ebay don't have the hardware or clips for proper installation. ACME does have the right hardware and I suspect that's what OPGI sells. Below are pics of the original for reference. thanks for the pics guys,it should be here today, if it does not have the Ts built on the back I will send it back and re order else where. I think g3chevy has the better of the two. I think the sewn in plastic T's would be a better install and fit. Yes, they would fit better but you'd have to use your old ones since no one reproduces these. So you could take your new headliner to an upholstery shop and have the old ones sewn in. Not sure how these old plastic bows would hold up to being sewn after 40+ years. The OPGI headliner I installed worked fine. Its just a different set up. My frustration is no one selling on ebay has the correct hardware to make the their headliner work for our cars. They say they are "specialists" in headliner manufacturing. But when you send them a picture of the originals for reference they have no clue how to respond. well just got here, and nothing on the back but a sewn on sleeve for a road, how many rows of Ts are supposed to be there, I just looked and I have 4 rows left on my old headliner. There are five rows. If it's just got sewn sleeves, how would they expect a person to install original style rods, anyway? Mcarlo77 wrote: There are five rows. If it's just got sewn sleeves, how would they expect a person to install original style rods, anyway? thats what im saying its deff going back already got the return label shipped, hate to spend the 200 at opg but its got to be done. If you mean the area above the rear view mirror, it's for a courtesy light. yeah, thats it. mine dont have any factory wires there so I guess it didnt come with it just the stock dome light in the center. but makes me think if I should add it before I install the new liner. I've got a few of those courtesy lights w/wiring if interested. Simple install as you run the wiring behind the headliner trim, down behind the "A" pillar trim and directly to the fuse box Accessory slot. Yes, easy install. It can be done with the headliner in. » What's your archery set up?